On Saturday the 24th of June 2017 I went to Victoria Avenue in Cambridge during Midsummer Fair to look into the deployment of civilians accredited with police powers under the “Community Safety Accreditation Scheme (CSAS)“. I had spotted people wearing the Community Safety Accreditation Scheme logo at the fair in previous years and wanted to find out what was going on. Power to control traffic for purposes other than escorting a load of exceptional circumstances, based on the powers constables have under sections 35 and 37 of the Road Traffic Act 1988. So that all looks potentially fine and above board. I discovered the that the officers were from Cash and Traffic Management Ltd when one accredited person approached me and came close enough for me to read the ID card they were wearing. In retrospect now having seen the company’s logo I can see that the logo also reproduced on the uniform being worn. Prior to reading the ID card I asked the officer who he was working for. The officer did not respond. When I read the company name from the ID card the officer put his hand over the card in an apparent attempt to prevent me from reading any more information from it. I don’t think it is appropriate for those empowered to exercise policing powers to hide their identity cards when engaging with the public. The accredited officer stood close to me and walked in circles around me. This was a bizarre thing to do which may have been intended to be intimidating or obstructive. I thought it was odd behaviour which wasn’t very conducive to having a reasonable conversation. I asked to see the officer’s card detailing the powers they had been given; I was interested in checking to see if the officers working in Cambridge were in possession of an accreditation from our own Chief Constable. The officer did not respond and walked off. On reviewing the video I can see the officer’s identity card contains what looks like five police force crests; perhaps indicating that five Chief Constables consider the individual to be suitable for exercising police powers. I have compared the crests with the Cambridgeshire Police force logo and cannot see one which matches. Something I had wondered in previous years was if those wearing the CSAS badges were accredited, but not in Cambridgeshire. The apparent lack of a Cambridgeshire logo on the ID card I saw leads me to continue to wonder. My plan was that if I didn’t find out what was going on from the accredited staff, to ask the police working alongside them. There were lots of police at the event alongside the civilians purporting to have police powers and I let a police officer know that I’d asked one of those wearing a Community Safety Accreditation Scheme badge if I could see their designation/accreditation but they had refused. The officer appeared confused, and disinterested. In retrospect I should not have answered the officer’s questions having made the clear report and perhaps asked to speak to the police event commander, if they were free. That might have been disproportionate though and I’ve collected clear video evidence which can be used to review what occurred in retrospect. I obtained video of the officers apparently using their powers to direct traffic. One officer wearing the CSAS badge had a different style of ID card with no photo and one large crest. The Cambridgeshire Police force webpage on the Community Safety Accreditation Scheme (24-June-2017 Snapshot), is scant and as I suspect it grossly out of date. It doesn’t for example list Peterborough City Council and South Cambridgeshire District Council as organisations taking part in the scheme. 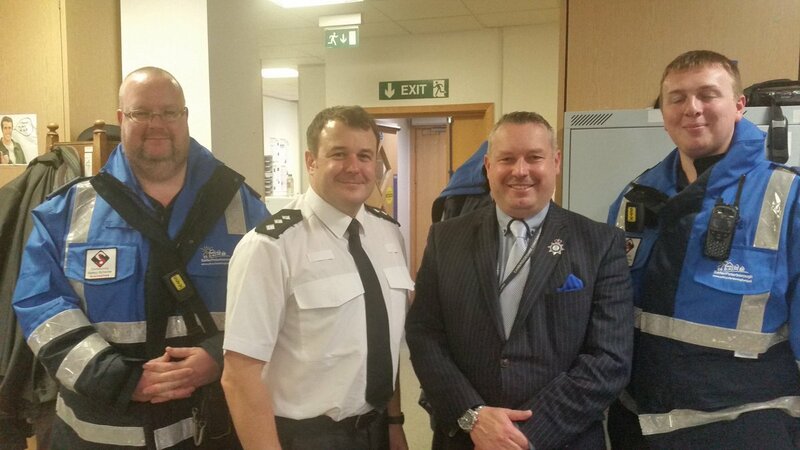 In November 2016 Cambridgeshire’s Police and Crime Commissioner tweeted a photo of himself standing next to “Safer Peterborough” enforcement officers who were wearing the CSAS logo (Archived image). When addressing Cambridge’s North Area Committee in March 2017 Police and Crime Commissioner Ablewhite referred to the fact council officers in Peterborough had been given police powers [under the CSAS scheme]. The Police and Crime Commissioner’s comments may suggest he is keen to see police powers given to council officers in Cambridge. Hopefully my experience will inform consideration of doing so. I see from the Police and Crime Commissioner’s February 2017 report the number of security staff at Addenbrookes with police powers has risen to 56. I don’t think many people would recognise the Community Safety Accreditation Scheme logo and understand what it means. We don’t give police powers to those directing traffic around roadworks, though we do require those involved to work to certain standards and in some cases to have relevant qualifications. I can see no reason for event traffic management to be handled any differently. I am concerned that our Police and Crime Commissioner and Chief Constable are risking the hard won and easily lost reputation of our local police by handing powers to these employees of private companies. I have considered if it would have been practical, and safer, to investigate more safely from behind a keyboard, via emails, Tweets and Freedom of Information requests. In previous years I had tweeted observations but I hadn’t even obtained clear evidence the CSAS badges were being worn. I don’t know who contracted Cash and Traffic Management Ltd, it could have been event organisers Cambridge Live, the travellers whose traditional event it is, one of our local councils or perhaps the police outsourcing some of their work. Going out to observe what was happening and ask questions was I think a reasonable step as part of investigating what is happening. Cambridgeshire Police Authority – December 2008 – CSAS was discussed. This entry was posted on June 25, 2017 by Richard Taylor.
.@CambridgeCops Good you're checking @SIAuk cards etc. Some wear CSAS police powers badges ; check their validity at the same time? Just something I noticed, in Norfolk British Cycling Federation staff have been given some policing powers; this appears to be common and the need for cycle race marshals to have the policing powers they have been given has been questioned. You express some valid concerns which I will raise with the Commissioner's office. Really weird situation, first time hearing about this. Empowering citizens with police powers only for the traffic management sounds reasonable, but aren’t there any other possible solutions other than that? This could easily be exploited if left unnoticed. I raised some of my concerns at the West/Central Area Committee on the 18th of July 2017. I received a one word response from the police, saying “yes” those puporting to exercise the powers were properly authorised. No councillors made any comment. As the one word response from the police didn’t explain the basis of the police position I don’t give it much weight. I am wondering if perhaps there is an as yet undisclosed national accreditation scheme involved. I followed this up again at the December 2017 West Central Area Committee. My question to the Commissioner and his response was specifically about CSAS officers working for companies providing security at events such as Midsummer Fair. The Commissioner explained that anyone working under the Community Safety Accreditation Scheme operated under a Code of Conduct with their local council and therefore anyone wishing for further information or to make a complaint should be signposted to the relevant authority. The phrase “a code of conduct with their local council” suggests a code of conduct agreed with a local council. Irrespective of any code of conduct it is Chief Constables who designate civilians with police powers, and it is they who should be held to account for the way the scheme is being operated; the public can hold Chief Constables to account via Police and Crime Commissioners. The Police and Crime Panel shouldn’t have been fobbed off by the Police and Crime Commissioner suggesting people asking questions should go elsewhere. I suspect the Police and Crime Commissioner confused the situation in Cambridge where the empowered civilians were private sector contractors with that in Peterborough and South Cambridgeshire where council officers have been given police powers. There was some discussion of this at the March 2018 West-Central Area Committee. The next thing on the actions is the report from the Police and Crime Commissioner, that request, there was a request and the Police and Crime Commissioner was notified of the question, we haven’t had a response back and I apologise that that hasn’t been chased yet. I’m not sure if this is relevant, it seams to me it is, that a fixed members briefing has been set for the 21st of March, here, from 6-8 and it’s actually raising a number of the issues that you have listed here. What I was going to suggest. The presentation on the policing structure is included, but your item two – request more information from the Police and Crimes Commissioner and city council regarding Community Safety Accreditation Scheme, now it’s Tom Kingsley who has organised this, so maybe if that item was included in this members briefing if it was apprioporioate then this would enable this item to be dealt with in that way, but I’ll leave that if other members think that’s another way to go, it’s just a suggestion. Meeting chair Cllr Nesthingsa said: “I think it was phrased as a question about who was making decisions about how members of the public can distinguish between police officers and volunteers”. The meeting chair appeared to believe that those with Community Safety Accreditation Scheme powers were volunteers. In the past a chair of a Cambridge area committee has expressed a belief that Police Community Support Officers are volunteers. The level of misunderstanding of policing roles in our society, and even among councillors, is surprising and illustrates the need for clarity and publicity surrounding . Cllr Gillespie asked for a comment from the council’s events team – I think that would be a good idea. Clearly those involved in hiring the common for the event may have something to say, but I suspect councillors might find they’ve outsourced the event to their arms-length “independent” body the “Cambridge Live Trust” from whom they may struggle to obtain information, though representatives of that body did attend area committees last year to present their annual report, so there has been some public engagement. I submitted a question on the Community Safety Accreditation Scheme just in case there was an update on that; to respond. But there wasn’t. I also support Cllr Bick’s request for a response to come here. I’m quite disappointed that there is going to be a private briefing for councillors with the Police and Crime Commissioner. I, and I’m sure many other people, would like to observe what the Police and Crime Commissioner has to say, and what the councillors have to say back. One of the things you were discussing was who you wanted a report back from and I think one of the reasons that you went to your community safety team at the city council was that one of the questions raised was about consultation with councillors. One of the key safeguards with this scheme is that schemes can only be introduced after consultation with local authorities so I was asking how has that taken place, was there a consultation years ago which is being assumed to give permission for all of these schemes? Certainly at the last meeting none of you could remember being consulted on the particular use on Midsummer Common. It would be excellent to get some clarity before we have Midsummer Fair again, before we have these people on the common again. As Cllr Gillespie says they are almost certainly there for traffic control but that’s not actually obvious to people as you walk in past them if they’re standing around the gateway. I’m not looking for any further comment on that. I’m sure you’ve dealt with that time adequately. Having reviewed everything that has been said what I think the Police and Crime Commissioner was probably trying to suggest is that any complaints about civilians with police powers under the Community Safety Accreditation Scheme should be made to the employer of those with the powers. I can’t see anything published by Cambridgeshire Police about any such complaints processes. The private contractors Cash and Traffic Management Limited don’t appear to publish a complaints process either. Under Section 41 of the Police Reform Act 2002 Chief Constables can come to arrangements with employers, my reading of the rather confusing legislation is that the Chief Constable still has to accredit the individual humans to whom powers are conferred. (The section refers to both organisations and humans, both of whom in legislation may be referred to as people/persons). Interestingly every Police and Crime Plan is required under Section 40(7)(c) of the Police Reform Act 2002 to include any proposals to modify the community safety accreditation scheme in an area.